With legendary talent, the freshest ingredients possible, and a tradition of fun, Commander’s Palace proves that great restaurants only get better with time. A New Orleans institution since 1880, the critically acclaimed restaurant has been the winner of the James Beard Award for Most Outstanding Restaurant in America and has been ranked the top dining establishment in the city for seventeen consecutive years, officially making any visit to New Orleans incomplete without a savory meal in the beautiful Garden District landmark. 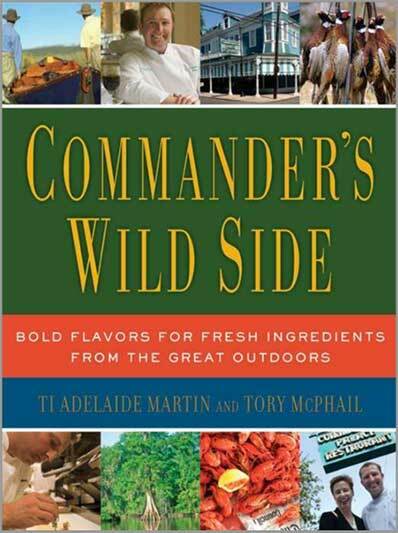 Nothing can stop the crew at Commander’s Palace, and Commander’s Wild Side, which features more than one hundred new recipes for fare straight from America’s bayous, streams, mountains, and back­country, as well as dozens of stunning photographs, proves it. With thrilling flavors for any palate, executive chef Tory McPhail has recipes for everything from Juniper Berry-Grilled Elk, Rabbit and Goat Cheese Turnovers, and Roasted Quail with Bourbon-Bacon Stuffing to Jamaican Conch Callaloo, Marinated Crab Salad, and Pecan Butter-Basted Flounder with Creole Mustard Cream. Looking for something more traditional? Try the Lemon and Garlic Grilled Pork and the Roasted Turkey or any of the nongame substitutions—just in case the butcher is out of mountain lion.